Irish angel Christmas ornament is a large design that features a harp along with loads of shamrocks. This Irish Christmas ornament is ready to hang on your tree with the included gold cord. This Irish Christmas ornament features an angel with red hair along with a harp and a shamrock enhanced gown. 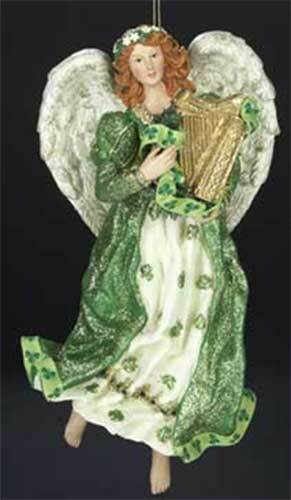 The Irish angel ornament is a large decoration that measures 9" tall. The Irish angel Christmas ornament is made of porcelain and Fabriché, and is gift boxed with a shamrock history card, complements of The Irish Gift House.